Thirteen-lined ground squirrel Ictidomys tridecemlineatus, photographed by Phil Myers. 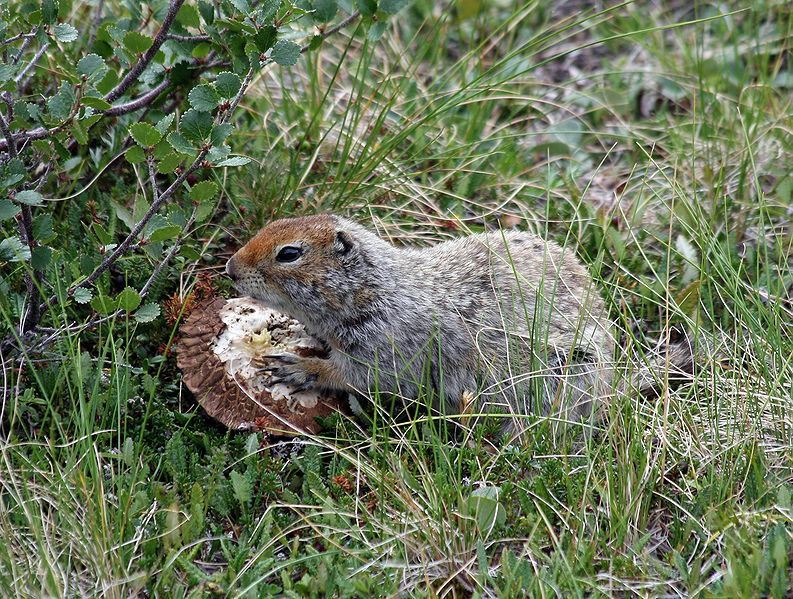 The Holarctic ground squirrels of the Marmotini were the subject of one of my earliest posts at this site, before I really knew what I was doing*. So I'll have a go at improving it now. *Not, of course, that I know what I'm doing now. 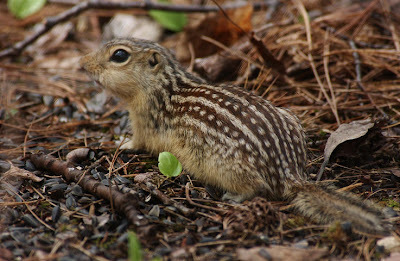 The Arctic ground squirrel Urocitellus parryii, photographed by Ianaré Sévi. Marmotini is the clade of squirrels that includes ground squirrels (Spermophilus), antelope ground squirrels (Ammospermophilus), marmots (Marmota) and prairie dogs (Cynomys). Authors seem to differ on whether to also include the chipmunks (Tamias), but the question is somewhat semantic: agreement seems to be universal that the chipmunks represent the sister group to the remaining marmotins (Herron et al. 2004), so the only real question is how inclusive one wishes to make the term. The Chinese rock squirrels Sciurotamias may also belong to the Marmotini (Steppan et al. 2004). Except for the semi-arboreal chipmunks, marmotins are largely terrestrial in habits. 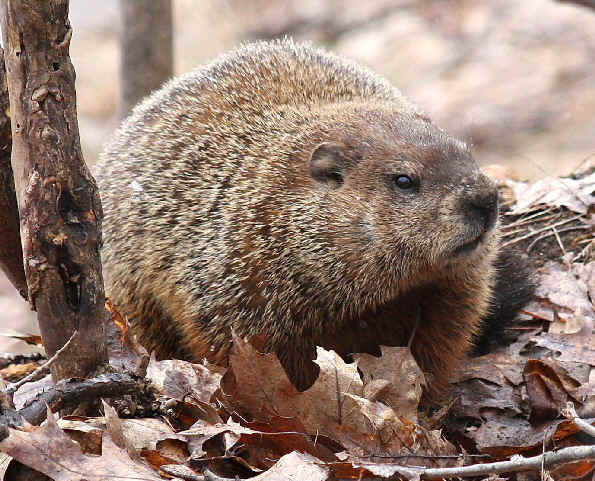 They nest in underground burrows (including chipmunks), and some species form quite complex societies. Père David's rock squirrel Sciurotamias davidianus, from here. Ground squirrels previously assigned to the genus Spermophilus* have a wide range through Eurasia and North America. However, both morphological and molecular data indicate that Cynomys is derived from within 'Spermophilus', and molecular data indicate that Ammospermophilus and Marmota are as well (Herron et al. 2004). Helgen et al. (2009) divided the former Spermophilus between eight genera. Six of these genera are found in North America, one (Spermophilus proper) is found in Eurasia, and only one (Urocitellus) spans the divide between northeast Asia and North America. Whether the Marmotini as a whole are Eurasian or North American in origin is equivocal: of the three basalmost branches, Sciurotamias is definitely Eurasian, Tamias could be either (the Siberian chipmunk Tamias sibiricus is the sister to the remaining North American species) and the Spermophilus clade is probably North American in origin, with dispersals back to Eurasia in Marmota, Urocitellus and Spermophilus (Herron et al. 2004). *Particularly in the European literature, it was not uncommon in the past to find the name Citellus being used in place of Spermophilus. Citellus Oken 1816 is indeed an older name than Spermophilus Cuvier 1825; however, the publication that the former derives from was not one that used the binomial system, and hence it has been declared invalid as a source of names (International Commission on Zoological Nomenclature 1956). The woodchuck Marmota monax, from here. Marmotins were the dominant squirrel group in North America during the Neogene; tree squirrels, though present, were exceedingly rare (Emry et al. 2005). The Pliocene Paenemarmota was the largest of all marmotins, reaching the size of a large beaver (Repenning 1962). Emry, R. J., W. W. Korth & M. A. Bell. 2005. A tree squirrel (Rodentia, Sciuridae, Sciurini) from the Late Miocene (Clarendonian) of Nevada. Journal of Vertebrate Paleontology 25 (1): 228-235. Helgen, K. M., F. R. Cole, L. E. Helgen & D. E. Wilson. 2009. 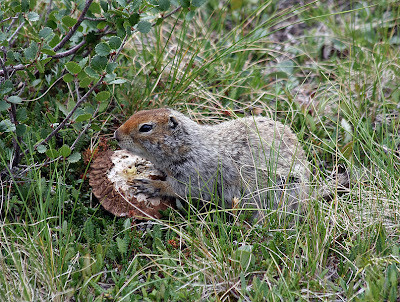 Generic revision in the Holarctic ground squirrel genus Spermophilus. Journal of Mammalogy 90 (2): 270-305. Herron, M. D., T. A. Castoe & C. L. Parkinson. 2004. Sciurid phylogeny and the paraphyly of Holarctic ground squirrels (Spermophilus). Molecular Phylogenetics and Evolution 31: 1015-1030.
International Commission on Zoological Nomenclature. 1956. Opinion 417. Rejection for nomenclatorial purposes of volume 3 (Zoologie) of the work by Lorenz Oken entitled Okens Lehrbuch der Naturgeschichte published in 1815–1816. Opinions and Declarations Rendered by the International Commission on Zoological Nomenclature 14: 1–42. Repenning, C. A. 1962. The giant ground squirrel Paenemarmota. Journal of Paleontology 36 (3): 540-556. Steppan, S. J., B. L. Storz & R. S. Hoffmann. 2004. Nuclear DNA phylogeny of the squirrels (Mammalia: Rodentia) and the evolution of arboreality from c-myc and RAG1. 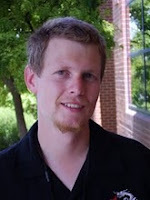 Molecular Phylogenetics and Evolution 30: 703-719. Thanks for this. I've been doing my host genera updates piecemeal (and grumbling about taxonomists a lot). Your post puts the changes in perspective and leaves me no excuse for not getting Helgen et al. and doing a proper job of it. So why is the thirteen-lined ground squirrel in the genus Ictidomys? Isn't there also Tamiasciurus for the Least Chipmunk? Without having the read all the references, I am just curious as to whether they are now generally lumped into their respective main genera or not. 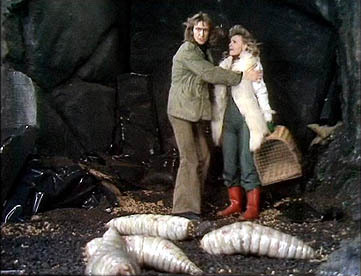 For the most part, the ex-Spermophilus genera have been split simply to allow the usage of only monophyletic genera whilst still maintaining Marmota, Ammospermophilus and Cynomys as separate genera. At least some of the current genera had been recognised previously as subgenera of Spermophilus. 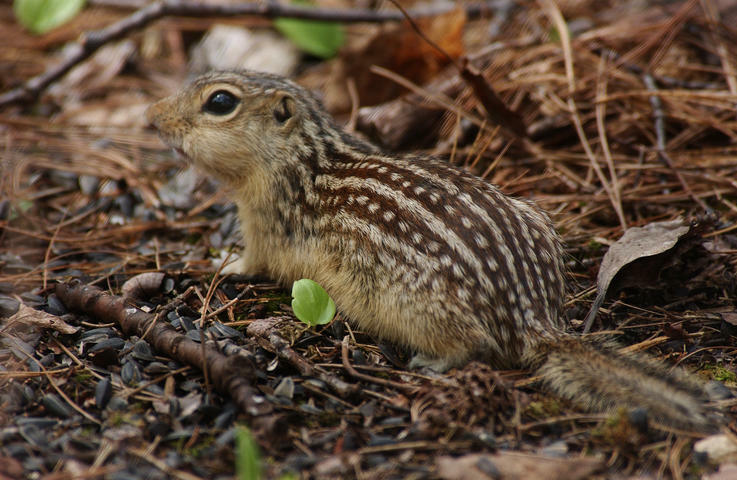 In the case of Tamias, the alternative to placing all chipmunks in a single genus that has been used is to recognise Tamias for T. striatus of eastern North America, Eutamias for the Siberian chipmunk, and Neotamias for the remaining chipmunks of western North America. As the chipmunks seem to form a monophyletic group whether recognised as one genus or three, this one is largely a question of how finely you want to tune your generometer. 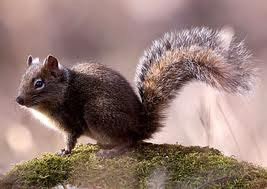 Tamiasciurus contains the North American pine squirrels, and has not been connected to the Marmotini (a relationship has been suggested between Tamiasciurus and Sciurotamias, but has not been supported in recent studies). But: re the claim that tree squirrels were rare in most of Neogene North America-- could this be largely a matter of preservational bias? Tree squirrels live in trees, which are often in forests, and long ago I was taught that forests (maybe for reasons of soil chemistry) make for poor fossil preservation. I believe it is the acid soils of forests that make them poor preservation habitats, yes (and maybe also the reduced likelihood of rapid burial). But on the other hand, other rodents such as chipmunks are apparently well known in the North American fossil record, and many biases against tree squirrel preservation might be expected to apply to them as well.